No pix, Joy. Don't see it in your blog either. I like the cardi. Does it make you feel up to date? I remember seeing cardis like this, but never tried one myself. I like the colors and the pattern. The jeans look pretty good to me, just a bit long. I'm having trouble with higher waisted jeans. I thought they would work better for me but they sag and slide down my hips just like the lower rise ones do. I've never tried Madewell jeans, so I don't know how they fit compared to others. Are the jeans comfortable? I'd keep them if they are, because for me, white jeans don't last too long before they get stained and become unacceptable. Also I have 2 black cats. I think both work, I like the combo with the purple top! But how do you feel about them? You must have some reservations to ask! MsMaven, the cardi feels up to date when I use it in a parrern mix as here. 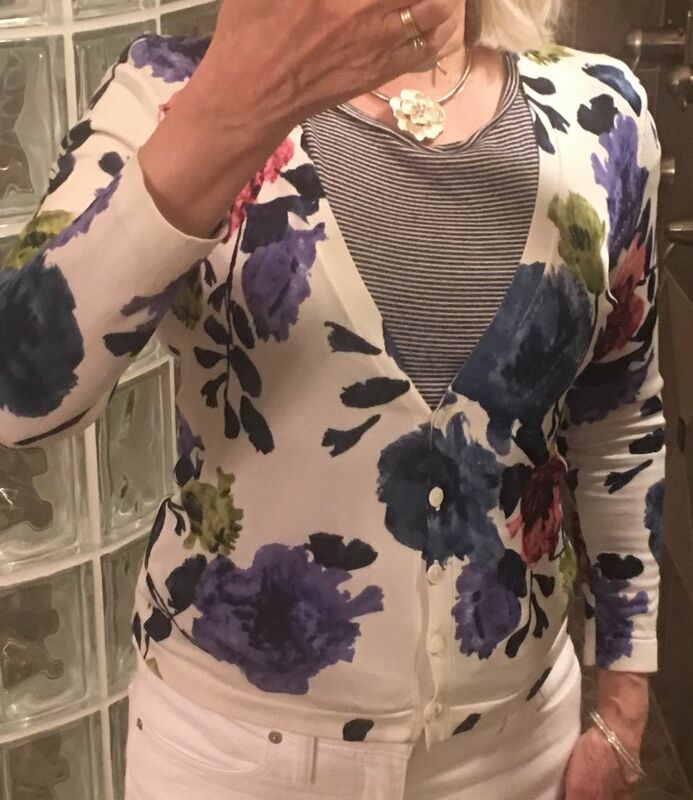 I mostly wear it with another patterned top. The cardi is a petite and has felt a bit too short so I thought I would try it with these high rise jeans. The jeans feel like a very nice fabric. They do slip down some. I hope having the waist taken in a bit will help. The fabric is thick enough that they don't show through.. I know what you mean about white jeans. Mine seem to always be in the laundry, especially as I line dry them. At least one pair also need to be ironed. Suntiger, I have lost my confidence in determining if fit is good. That is why I ask for help. I think these are keepers but don't want to keep something that others see as ill fitting. Thank you both for your comments and questions. They help me see the outfit though your eyes. Joy, does the cardi button up like a top? My feeling is always if someone loves and is happy with something-great! If they worry, post k/r, there's something that doesn't feel right to them. I can think something looks great-but it's not me wearing it. Can you button all the buttons? As it is only buttoned by the bottom couple of buttons and seems snug, the cardi looks a bit skimpy to me. But I like the floral/stripe pattern mix. Jeans looks great, so if they are comfortable, keep. The cardi can button all the way up like a top, but it does have a deep V neck. I will try to get some more photos. I wanted the striped shirt underneath to show so left some bottoms undone. The cardi should be larger. It is probably time to let it go. I just buttoned all the cardigan’s buttons. There are only enough to go half way up, so it cannot make a top on it’s own. These 2 views are buttoned up all the way. The Cardi is fiitted but looks good on you. Thank you, MsMaven, you are a sweetheart. Looking at the photos, the cardigan looks too fitted for my style. I suspect a lot of my wardrobe needs to be replaced. I like the pattern mixing. And the tops look good with the jeans, too. I like all of this! Cute pattern mixing, and the rise on the jeans is good. The jeans look great on you. I like the cardigan with the striped top. Very cute. Thank you, Lucy and Style Fan. I like the pattern and the colors and pattern mix. And actually like it better buttoned all the way. Jeans look fab, but they don't look to me high rise in the pictures. NICE. Thanks for the extra pics. Make sure you do the sit-down test. I think if you want to wear the cardi buttoned up maybe go for a different neckline in the top underneath. I think the v of the cardi would look better with a wrap top or a more scooped neckline (not so high). The jeans look good to me. Thank you, Anchie, Angie and Brooklyn, for the good advice. Anchie, I have yet to find a pair of jeans that are actually high rise on me. What a pain. I have cardigans that fit close like yours, so I think it works. But I would likely wear it open, not sure how that floats your boat. Jeans look fine to me. I like the white jeans + white flats look. Leslie, I wear most cardigans and jackets open and only buttoned this up because of Angie's blog post on it. I will probably keep the white jeans as they will be in the laundry at least once a week, unless they don't pass a sit down test. I think they are fine as they are long and quite stretchy. After seeing an older woman wearing high rise jeans in church today sitting in front of me, I'm not sure I want that Mom jeans look anyway.. She had acid wash high rise blue jeans with a cropped pullover sweater and I had a 70's flashback. Yes, keep thit jeans and the cardi. I really like both on you. I also liked the suggestion to try a top with a lower scoop neckline. Fun pattern mixing! Well I like this Joy! I feel uneasy about your saying “I suspect a lot of my wardrobe needs to be replaced”? I don’t understand why you say that because you always look so good. Of course some outfits are even better than others but then that’s why we ask for opinions on YLF? The pattern mixing is great here and the white jeans/shoes also. I do agree with Brooklyn to maybe try a new neckline-but would also look good open. Thank you, Jenni. I should say that I do not wear any wrap or scoop neck tops. I am basically too flat chested for these styles to work on my body. I say that I need to replace a lot of my wardrobe because insulin has cause a weight gain that I hate but is beyond my control. Added exercise is no help.. I am trying to eat as little as possible but even that is not helping.. It seems that insulin triggers ones body to store fat. I think the jeans look wonderful on Joy. 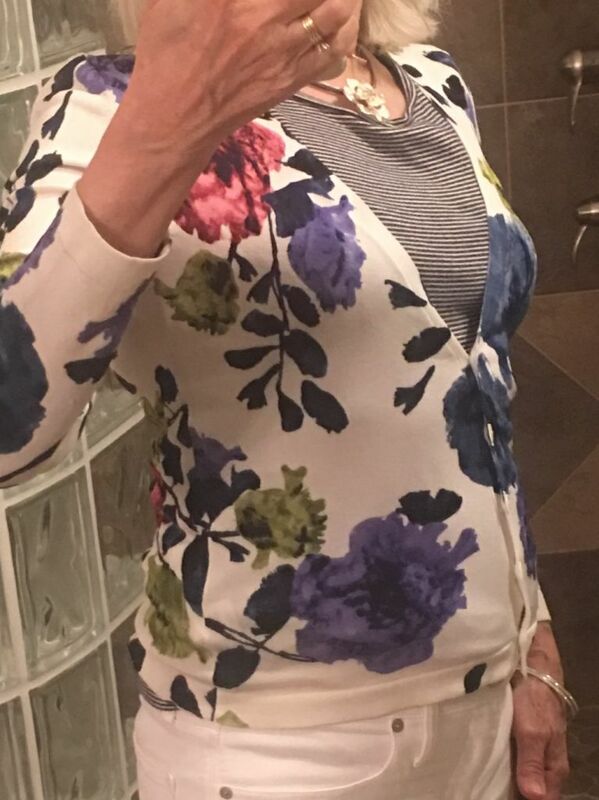 I also like the cardigan but suspect I would like it better unbuttoned with a skirt or dress. I can't see the weight gain here but I am sorry that you are feeling less than fab.